Choosing color for your art, digital or traditional, has been made easier than ever with the debut of the new Scribble pen. This pen, which is currently in the works, will be able to use a built-in scanner at the end of the pen to capture any color you can find, and translate it into usable ink! This is accomplished through the use of an onboard computer, which translate the scanned color into its six-digit RGB hex code equivalent. 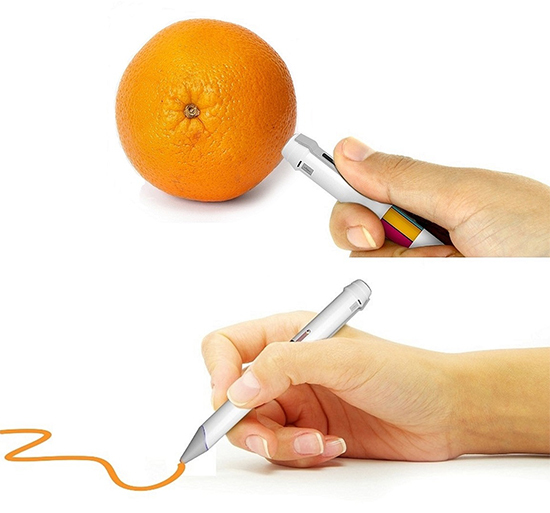 Then, five rechargeable cartridges located inside of the pen will automatically mix the necessary ink to recreate the color, which can then be used to draw on anything you’d like. On top of that, a stylus version of the tool is also in the works, which will be able to connect to any tablet or computer via Bluetooth or Micro USB adaptor, and perform similar tasks digitally. Each pen can store information on 100,000 colors at any time, and can detect up to 16 million colors with its scanner. With the pen version priced at $145.95 and its digital stylus equivalent priced at $79.95, these pens will be available for preorder in the coming months, making them an ideal tool for artists in any craft.